Festivals really aren't my kind of thing. Rolling about in the mud, standing round a crowded stage and getting covered in beer? No thanks! 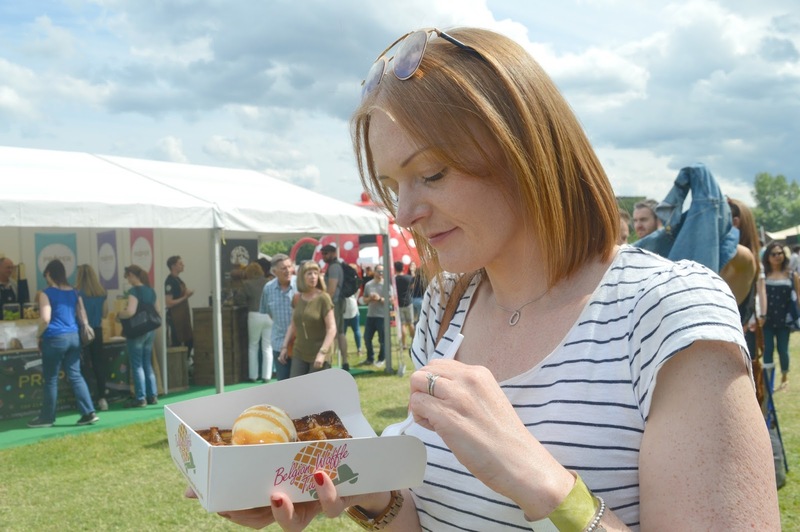 This year however, I've found the kind of festival that I can get on board with - the Foodies Festival is touring the UK this Summer, and it's heaven for the food lover. 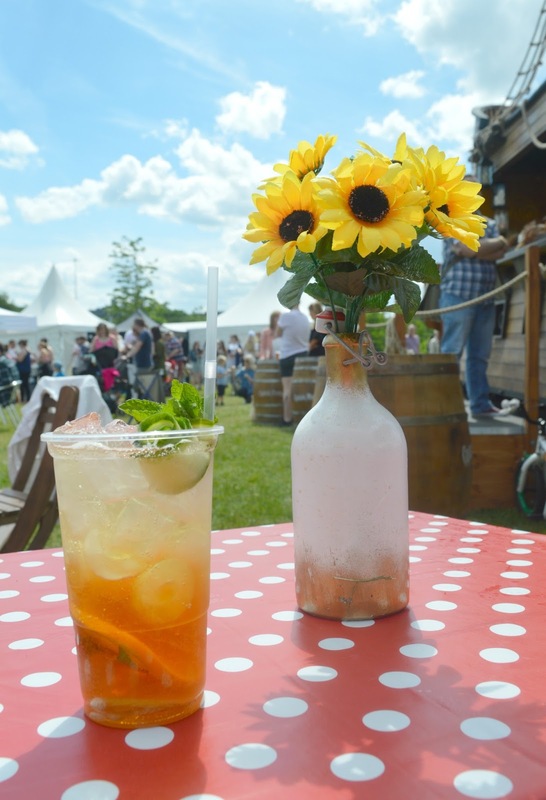 Bunting covered tents, homemade cakes, local street food and Pimms - I've found my perfect festival! The Foodies Festival arrived in Newcastle's Exhibition Park last weekend, bringing with it delicious smells and the promise of endless scran - it wasn't exactly hard to convince my husband to come along with me (the appearance of his crush, Candice from Great British Bake Off may have helped). We were guests of Kingsland Drinks who kindly treated us to VIP tickets for the day to enjoy a delicious glass of Prosecco from Borgo Molino - a perfect Summer treat. Going VIP promised us a welcome glass of bubbly on arrival, a goody bag, priority entry to the talks and demonstrations and access to a special VIP tent with some tables and chairs to rest our weary feet. 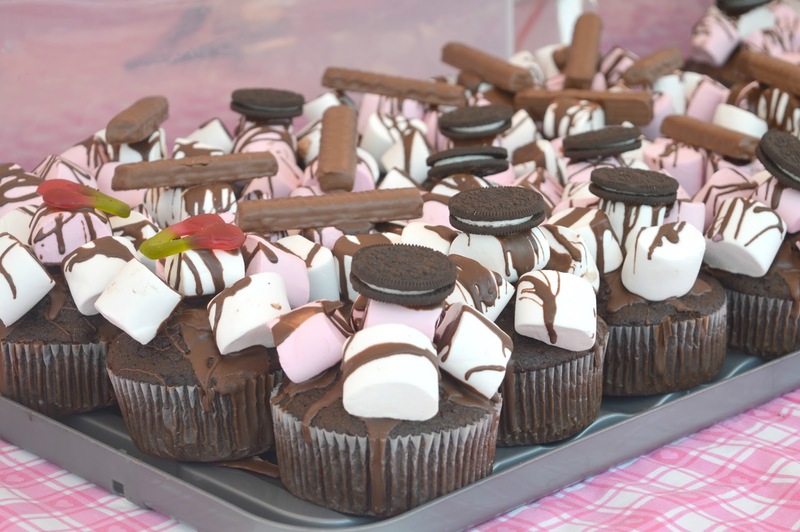 The Foodies Festival visited Newcastle from Friday to Sunday with three days packed full of foodie fun. The timetable was announced in advance with different shows, demonstrations and talks taking place on each day. 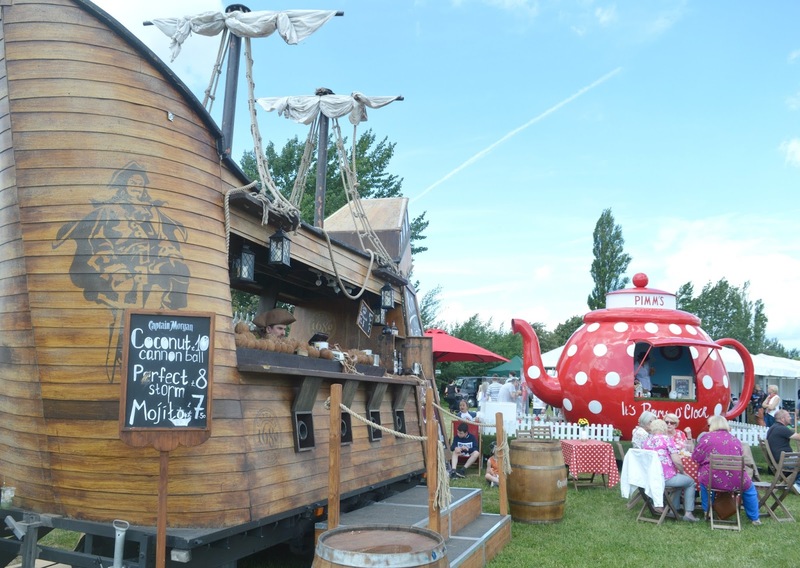 It was a beautiful sunny day at Exhibition Park when we arrived on Saturday which meant for the first few hours of our visit we didn't get beyond the Pimms teapot. 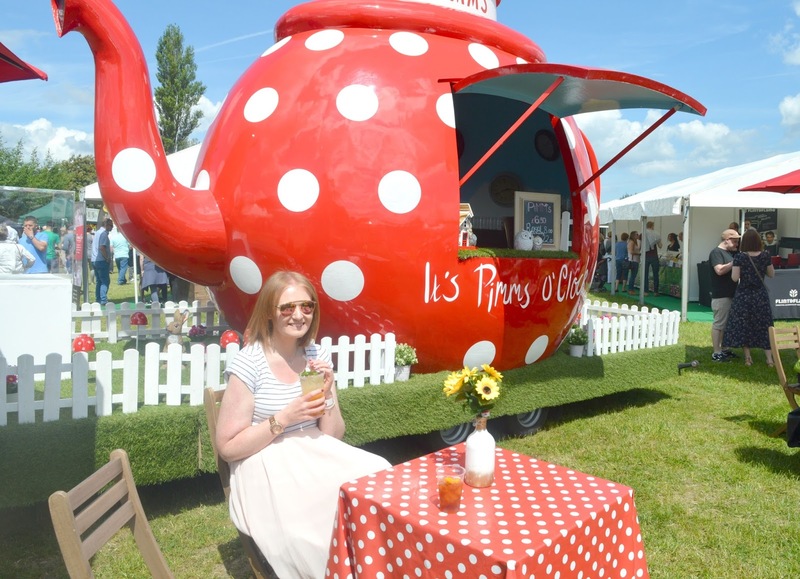 I mean, when you spot a teapot this beautiful, complete with the cutest tables and chairs it'd be rude not to declare it "Pimms O'Clock" am I right? I enjoyed a "Royale" (£8.00) (Pimms mixed with Prosecco - delicious and highly recommended!) followed by a generous cup of Pimms (£6.00). My first of the year, as soon as I have that delicious first sip it truly feels like Summer to me. Simon was pretty taken with the Rum bar that was perfect disguised as a pirate ship (so cool!). He had spotted his favourite drink, Old Fashioned, and although they were a pretty steep £9.00 for a small cup he indulged. It's not every day you're served rum by a pirate! We happily spent a good while enjoying our drinks in the sunshine listening to the live music and letting our skin soak up all of the beautiful Vitamin D. By around 12:00 pm the place was getting pretty busy so we were happy that we'd grabbed ourselves a seat. Pretty soon we realised we were beginning to get a little tipsy so thought it best we go off in the hunt of food. When you're at the Foodies Festival where on earth do you begin with making a decision on where to go. Endless stalls covered in food wherever we looked, it was so hard to decide where to go, and the pressure was on to make a good choice. Every now and again Simon would turn his nose up to the sky and declare "Pulled Pork!" but then I'd be distracted by someone walking past with some epic looking Caribbean food - HELP! Bumping into our lovely friend Rachel from Life in Geordieland meant that we ended up following her lead and joining the queue at Hatch 76. 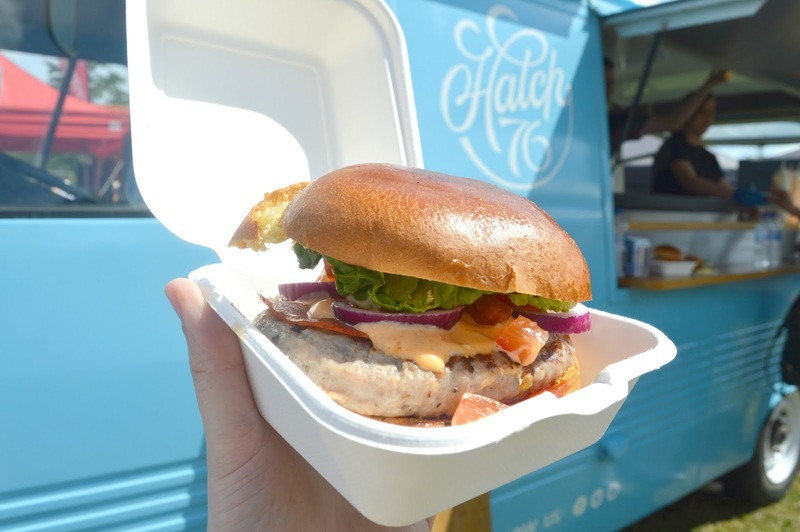 Local foodies Hatch 76 serve indulgent gourmet sandwiches from a beautiful blue vintage van. Having made it to the front page of that day's Journal I was inspired to try the popular Duck Sub (£5.00) - slow cooked duck, crispy bacon, tomato, red onion jam and plenty of mayo all served in a delicious brioche sub. Simon has a complete addiction to chorizo so his eyes lit up when he saw the Pork and Chorizo Burger (£5.00) - pork burger stuffed with chorizo, red pepper relish and lettuce served in a brioche bun. The sandwiches were fantastic and I can't believe I've never tried Hatch 76 before. Make sure you follow Hatch 76 on Facebook to see where they'll pop up next. I can't wait to see them again out and about in the North East. As we walked to the back of the festival to the Chef's Tent we just made it on time for the start of Lorna Robertson, Masterchef finalist 2017 and, of course, local lady. Giving a live demonstration for a tent full of eager fans, there wasn't a seat left in the house! Now, you might be wondering when Simon's number one lady Candice is going to be making an appearance? Well! 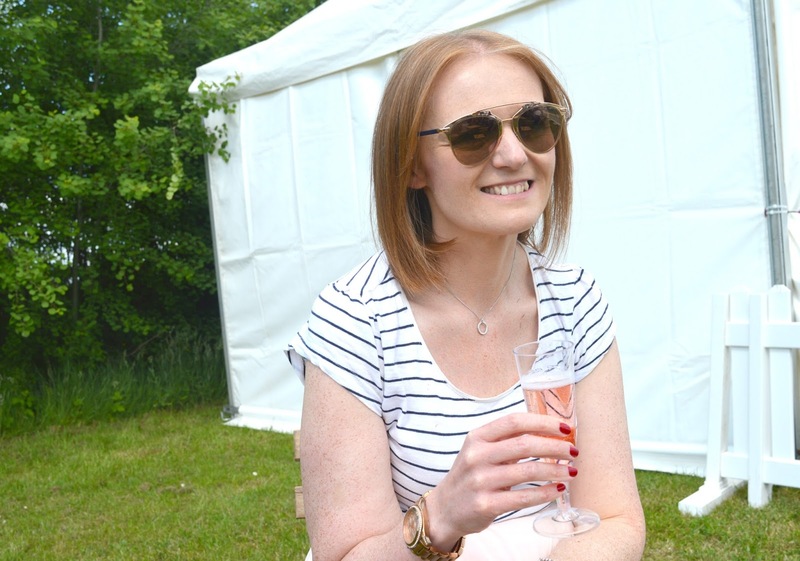 She attended the Foodies Festival on Sunday and we went on Saturday! What a cruel wife I am! I'm hoping Simon forgave me as soon as I let him fill his boots with delicious treats. We were soon ready for a sweet treat and I headed straight for the lit up "WAFFLES" sign that had caught my eye from the very start. 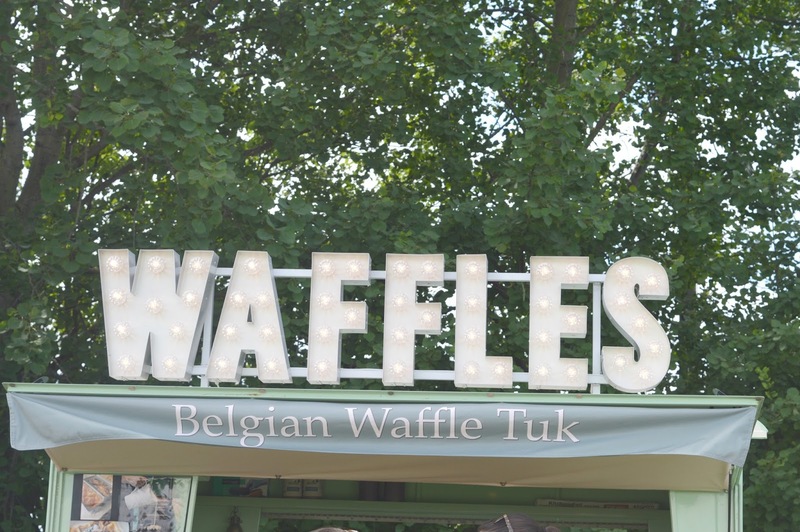 The Belgian Waffle Tuk are another local street food vendor who I've never tried before. 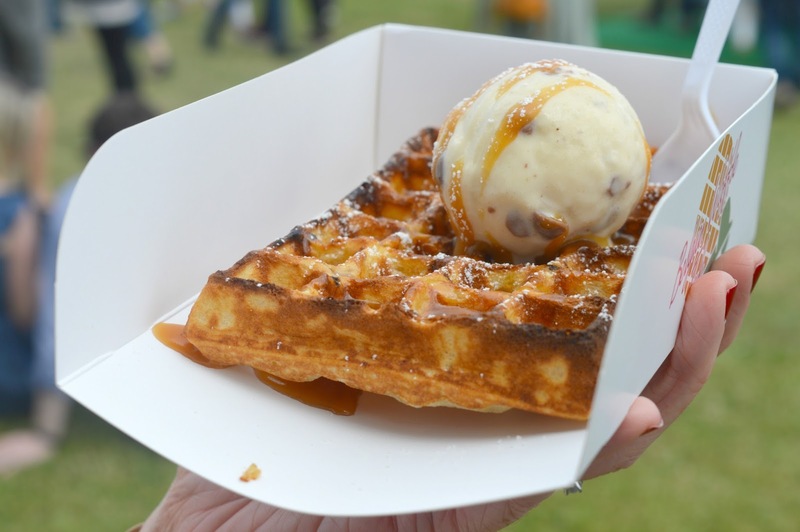 The North East's first belgian waffle van serve up delicious waffles using their own special waffle batter which come slathered in a choice of sauces, toppings and Archers ice-cream. I let Simon have some huge chunks of my waffle, I think he was a bit gutted he didn't get one for himself, but he had something else on his mind. Ice-cream! Morwick Dairy had their ice-cream trailer at the Park and Simon was in his element when he saw Salted Caramel on the menu. We're still slowly working our way round all of the amazing ice-cream vendors in the North East (we're seriously spoilt) and were so happy to finally get the chance to try Morwick Dairy. I stole a couple of tastes and it was so good! 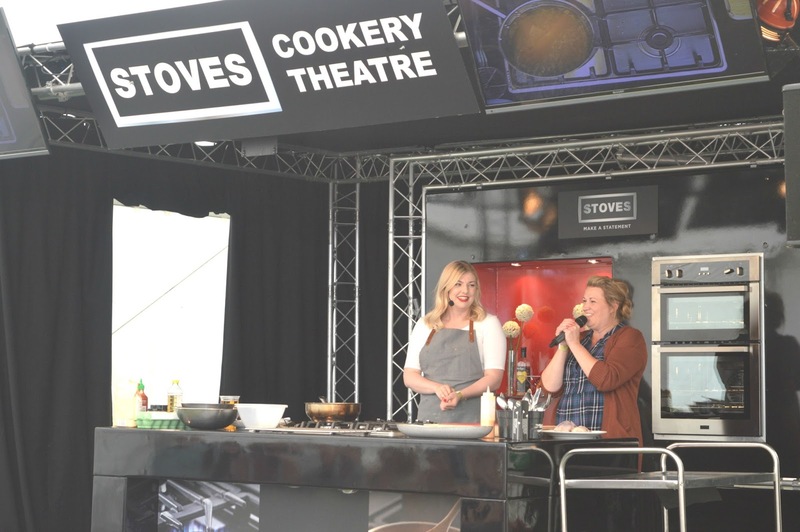 The Foodies Festival has already made its way round a few locations in the UK, with Newcastle being about half way through the tour. If you're interested in going yourself then it continues to Birmingham, Blackheath, Tatton Park, Edinburgh, Alexandra Palace and Oxford. Tickets cost £10.00 for a day ticket or £20.00 for a three day ticket and are available here. If you fancy being VIPs like us tickets cost £35.00. However, I would never mislead you guys and I honestly don't think the VIP tickets are worth the money - priority seating at the talks didn't guarantee us a seat despite turning up early, the goodie bags were awful and there weren't any more seats in VIP than there were outside! If we'd paid I think we would have been pretty furious! 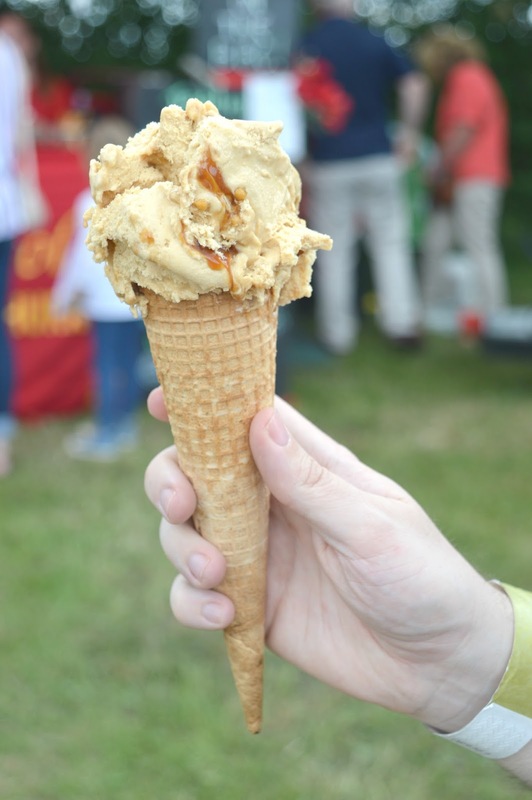 We really loved our day at Foodies Festival, it was the perfect start to Summer and has got me excited about attending more local food markets and festivals in the coming months. 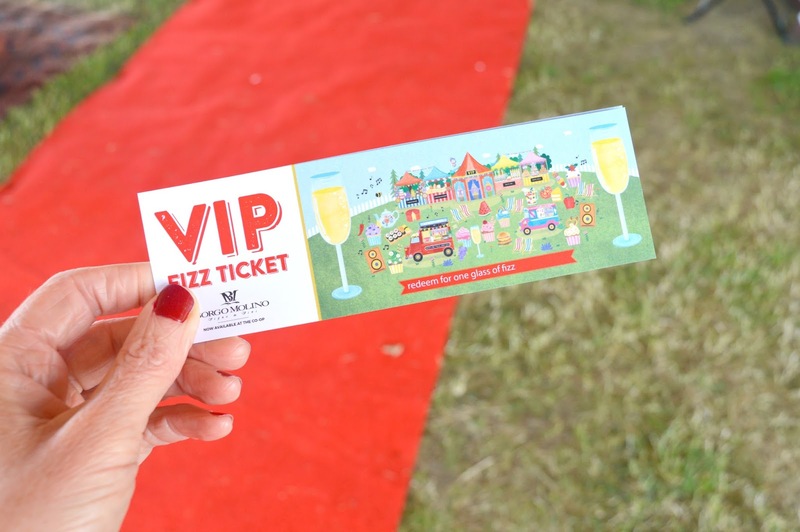 We were given complimentary VIP Tickets to the Foodies Festival but all food and drink was purchased ourselves. THAT PIMMS TEAPOT. It's amazing and oh my I want to try a Pimms Royale because that sounds freaking delicious. Love that you were honest about the VIP tickets btw! Love the honesty re. VIP tickets - think there are a few bloggers who should take your lead! Oooh gutted I missed this! Sounds lovely, but expensive to pay to get in and then pay £9 for an old fashioned! I agree Chloe, this looks like my kind of festival too!